But if you have got more than one, and you can manage them centrally with the FirePOWER Management Center, (formally SourceFIRE Defence Center). WARNING: If you are going to use FMC DON’T register your licences in the ASDM, they all need to be registered in the FMC. Before you can register the SFR module in the FMC, you need to have set it up, and have ran though the initial setup. The process is the same if you intend to use the ASDM or the FMC. 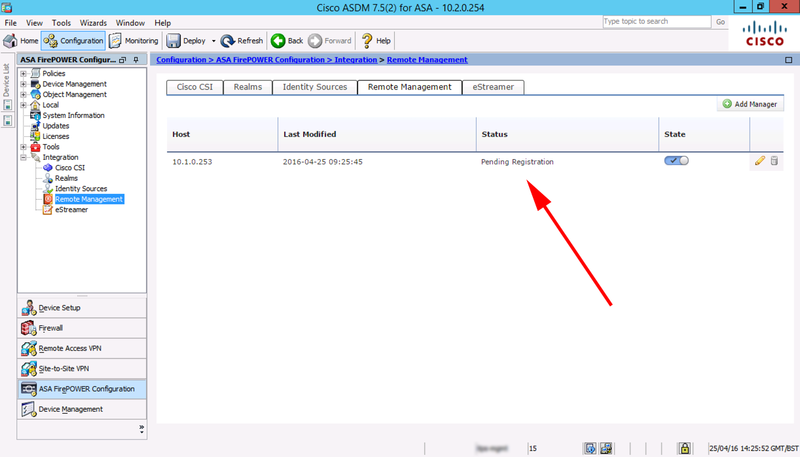 You can then choose whether to register from command line in the SFR, or via the ASDM. Opening console session with module sfr. You can then add the FMC as a manager, you will need to supply a registration key. Please make note of reg_key as this will be required while adding Device in FMC. 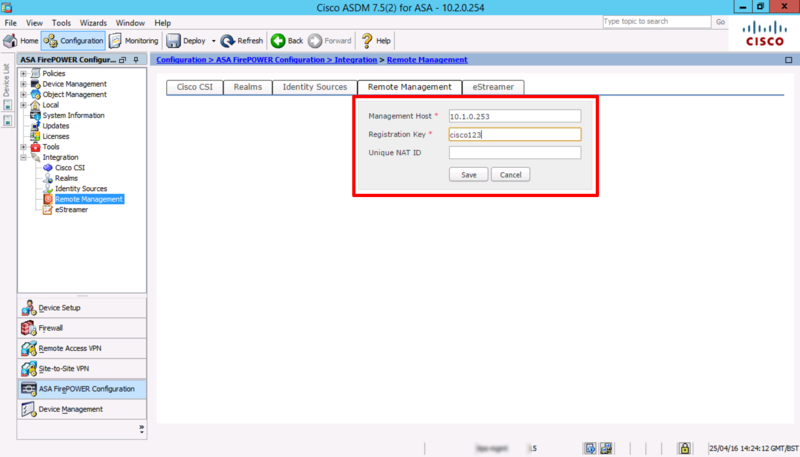 Connect to the ASDM > Configuration > ASA FirePOWER Configuration > Integration >Remote Management > Add Manager. Specify the IP of the FMC Appliance, and registration key > Save. It should then say ‘pending registration’. 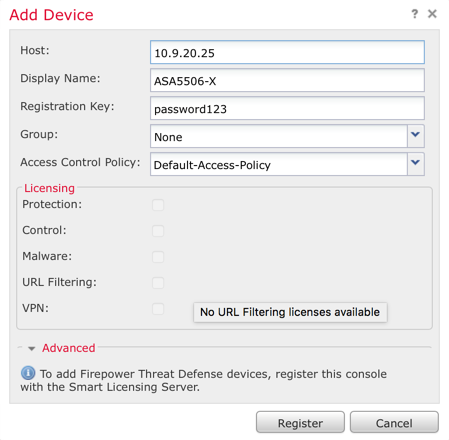 Log into FMC > Devices > Device Management > Add Device. Provide the IP of the SFR module, a display name, the registration key you used above. If you have setup a group you can use it and select your Access Control Policy (dont panic if you have not configured one yet) > Register. Could not establish a connection with sensor. 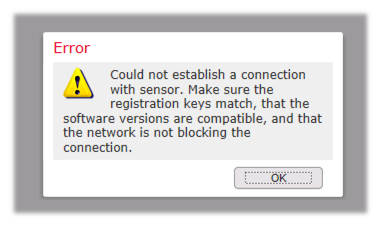 Make sure the registration keys match, that the software versions are compatible,and that the network is not blocking the connection. Had this problem for a while, (Credit to Craig Paolozzi for finding the fix.) Both the SFR, and the FMC console needed static routes adding to them (even though they could ping each other!) Pointing to each other. 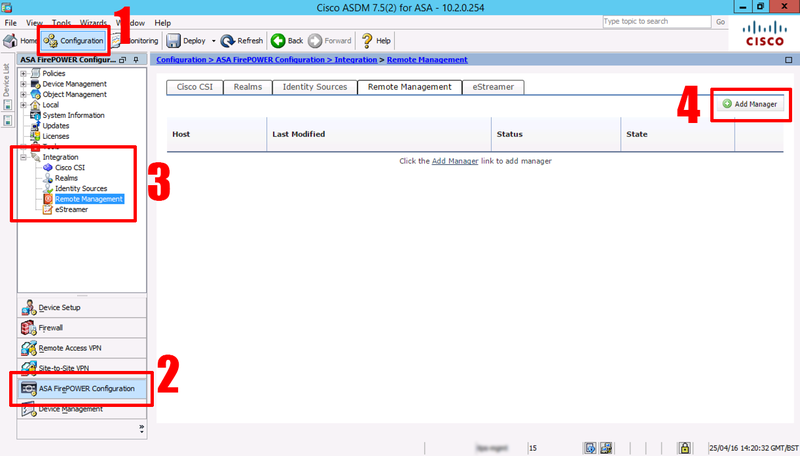 After adding my ASA to the FPM, I noticed that the FirePower module option was removed from ASDM. Is there a way for both to manage the Firepower module instead of one? ASFAIK – No, 6.1 and over should be web manageable, but I’m willing to bet that will get disabled when added to FMC. The old CX modules used to stop being locally manageable when they had been added to PRSM. Hi Pete. Thanks, great post. I need to do this procedure but the previous ING registered the licenses in the ASDM. What should be done in this case? 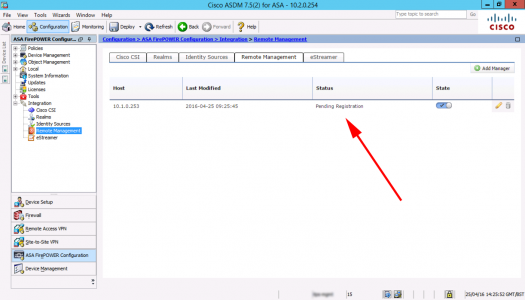 Easiest way is to speak to Cisco TAC with the licensing query. Or you can log into the licence portal and migrate the licences. Hi Pete. Thanks, thorough post as always. I have a question though : have you ever tried to manage distant SFR with an FMC ? I am managing ASA 5506 w/Firepower for several customers and I would like to be able to centralize everything in our FMC. I don’t have S2S VPN with any of them and I can’t find a decent configuration guide on cisco’s sites. I’ve only ever done this with Site to Site VPNs, I suppose you could do a one-to-one NAT on the SFP IP address, but I’ve never done this in anger?